Shelves in the local grocery store in North Carolina where Shelby King now lives, are completely empty ahead of Hurricane Florence. King and her family have opted to ride out the storm that is expected to hit shore this weekend. “Snow Camp” may seem like an odd name for a small town about two hours from the Atlantic Coast in North Carolina. It has however proven to be a nice place to live, according to Shelby King, a Portsmouth native and 2013 graduate of Minford High School who relocated south with her husband and three children in January. If you have paid any attention whatsoever to any news whatsoever, you are almost certainly aware the Kings may be facing some rough – not to mention wet – times in the very near future. As she talks on the phone about what is going on around her, King, 24, seems very calm and matter-of-fact. The well-advertised Hurricane Florence is expected to hit the East Coast Friday or over the coming weekend. King said local experts where she lives are predicting the bad weather will reach her area Friday or possibly as late as Sunday. Whenever the severe weather arrives, King believes she and her family are about as ready as they’re going to get. According to King, local stores are simply empty shells. She went to a supermarket presumably to stock up on Monday. She was too late. Bottled water also was missing from stores. King noted her family and many around her use well water. If the power should go out, the water will go out as well. King said she and husband David have been rounding up any jug or container they could find and washing and filling them with water. Like their neighbors, they also have filled their bathtub, King commenting the latter will at least hopefully allow the family to flush the toilet in case of emergency. The King family includes one daughter, four, along with two young sons, ages three and one and a half. Even the four-year-old is not really aware of what might be happening, King said. Obviously, that is partly because of her young age, but also because her parents deliberately have chosen not to frighten their children. King said the somewhat older children, around ages eight or nine, of some in-laws are in a panic about what might happen. She commented she and David King want to spare their children as much fright as possible. “At least until after the storm,” Ison added with a frown. She was asked how mom felt about her daughter and her family possibly being stuck in the path of what has been described as potentially a very major hurricane. “She’s not happy about it all,” Ison said, adding she’s been trying to talk her daughter into coming home since Monday. Shelby said she and her husband considered coming back to Portsmouth but in the end decided to stay where they are. King noted leaving now might be next to impossible. The North Carolina coast is under a mandatory evacuation order and King described roads as completely blocked. Shelby works on a horse farm not far from her home. That farm had a horse show planned for Friday. The show is now canceled. King already was told not to even bother to try and get to work after Thursday. The Kings have done what they can to batten down the hatches. Besides loading up on as much water as possible, the family has flashlights, batteries and cans of gas all on hand. King commented she was lucky to find the batteries and talked about an extremely long line at a local gas station. In the end, she insists she is not panicking. “We’re trying to stay calm for the kids if nothing else,” she said. 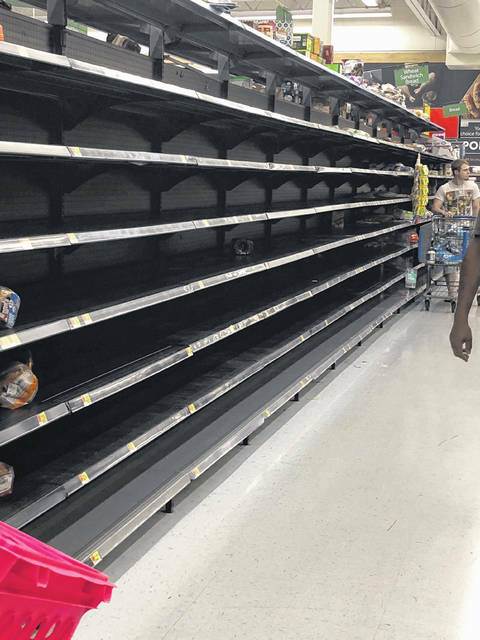 https://www.portsmouth-dailytimes.com/wp-content/uploads/sites/28/2018/09/web1_Empty-Shelve.jpgShelves in the local grocery store in North Carolina where Shelby King now lives, are completely empty ahead of Hurricane Florence. King and her family have opted to ride out the storm that is expected to hit shore this weekend.